I love everything Gene Roddenberry was ever attached to.Â I love it all and I love it unconditionally.Â I know all about it and Iâ€™ve been called a nerd so many times that it has lost the sting.Â But out of all his manifestations, none are the better than the original series that introduced us to the most compelling space crew of all time.Â Now itâ€™s ready for you to bring home in a brand new format. Starting this April 28th, now available in a seven disc Blu-ray boxed set from CBS DVD and Paramount Studios Home Entertainment comes the consummate collection of episodes from the first season of one of the greatest science fiction television shows of all time.Â Star Trek â€“ The Original Series â€“ Season One â€“ Seven Disc Blu-ray Boxed Set is ready to beam you up and send you into a fantastic and delightfully campy future at warp speed!Â Bring home this absolutely innovative and ultimately trendsetting first season today! This seven disc set contains all 29 first season episodes.Â Come along with Kirk, Spock, McCoy, Sulu, Scotty, Uhura and rest of the crew from the Starship Enterprise on their great five year voyage to do all that great stuff.Â There are near fights to the death, phasers set to both stun and kill, photon torpedoes all over the place, nefarious alien plots, valiant actions by Kirk, Spock and McCoy, beautiful alien women in strange costumes, daring space maneuvers and so much, much more.Â Some of the episodes included in this boxed set are â€œThe Corbomite Maneuver,â€ â€œDagger Of The Mind,â€ â€œMuddâ€™s Women,â€ â€œThe Enemy Withinâ€ and so many others.Â This first season features William Shatner, Leonard Nimoy, DeForest Kelley, James Doohan, Nichelle Nichols and so many nameless red shirts that youâ€™ll want to cry. The special features included in this seven disc boxed set are preview trailers for every single episode, a featurette about bringing the classic series up to date in terms of special effects, the ability to bring up special trivia facts and picture-in-picture commentary on six different episodes, a look at the romances in the first season, some great rare home movies and special memories from the series, an interactive look at the Enterprise, a great featurette about Gene Roddenberry, a deeper look at Spock, a look at where this series sent William Shatner, a look at the ethos of the first season and how this season began a legacy that has yet to die. Watching everything in this boxed set at one time would take more than 24 hours.Â Thatâ€™s just one of the many overwhelmingly fantastic things about this show on Blu-ray.Â The special features are amazing and provide you with what is truly one of the best possible experiences when it comes to fans of the original series.Â Seeing it all in high definition is so much better than the scratchy VHS copies I was stuck with back in my childhood.Â But the greatest part of this boxed set isnâ€™t all the fancy new stuff, it is the old, classic episodes themselves.Â Itâ€™s Shatner and Nimoy and Kelley, the holy trinity of sci-fi.Â Itâ€™s the scientific and cultural vision of Gene Roddenberry, a man who created a realistic and painfully attractive utopian future for the human race.Â Itâ€™s the unabashed excitement and sense of possibility in these classic episodes.Â Thatâ€™s where the real draw is and thatâ€™s where it will always be.Â Bring home this true milestone in television entertainment today. The Original is back and itâ€™s better than youâ€™ve ever seen it! This seven disc Blu-ray boxed set is available at Amazon.com. 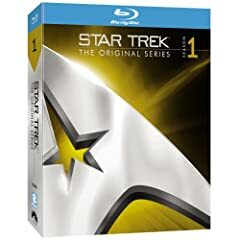 No user commented in " Movie Review: Star Trek â€“ The Original Series â€“ Season One â€“ Seven Disc Blu-ray Boxed Set "